Theatre, built 1817 in the town of Helsingør (north of København). 1846 redecoration by C. F. Christensen. 1896 rebuilding. 1957-1962 translocated to the open-air town museum "Den gamle By" (The Old Town) in Århus. Reverse Text: "Den gamle By, Århus. Helsingør Theater. Interior. 19. årh.s førsste halvdel. / Theatre from Elsinore. 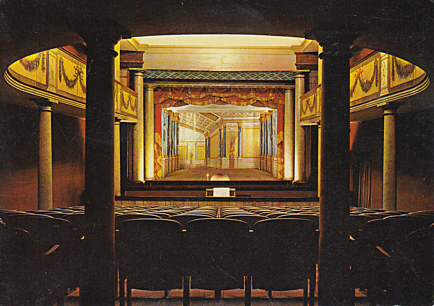 Auditorium, first half of the 19'th century. / Theater von Helsingör. Zuschauerraum, erste Hälfte des 19 Jahrh." Reverse Text: "Den Gamle By, Århus. Helsingør Theater. Foeyer, 19. årh.s førsste halvdel. / Theatre from Elsinore. 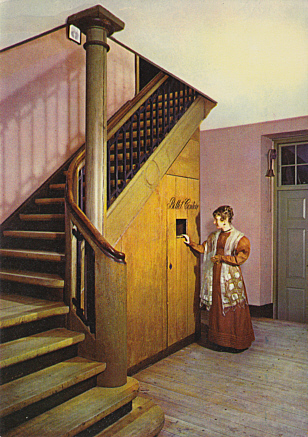 Foyer, first half of the 19'th century. / Theater von Helsingör. Foyer, erste Hälfte des 19 Jahrh."